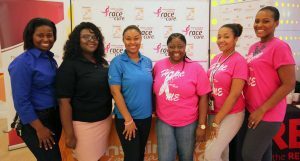 According to Etienne, “It was important to us, as a corporate citizen to help push breast cancer awareness.” She also referenced the company has partnered with several local charities during the month of October including the Grand Bahama Hope Ball, Cancer Society Gala Ball and Komen Bahamas Race Marathon. REV television subscribers are invited to tune to channel 212 on race day for an exciting commentary, wonderful stories and scenery from the ground and the air as REV once again brings highlights from the day’s events. Persons interested in participating in the marathon or learning more about the event can visit www.komenbahamas.org for more information.